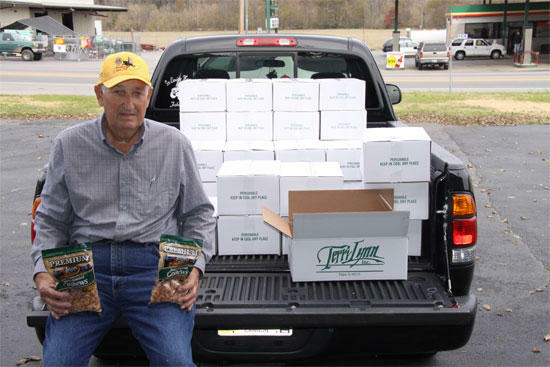 Lions Club member Clyde Bush shows samples of some of the nuts that are available for purchase during the annual Pecan Sale. Jennings Jewelers, Vance Bros. Car Lot, Bromley-Jennings Car Repair Shop, Rite Aid Pharmacy, Cutting Edge Salon, Bobby Smith’s Office, Cannon County Senior Center, Dr. Trea Wessel’s Office, First Bank, Paul Reed’s Furniture Store, First National Bank, Stones River Hospital, Regions Bank, Woodbury Funeral Home, Woodbury Nursing Center, Woodson’s Pharmacy and any Lions Club member.